thank you for interest in our University. Before applying, please check with the coordinator at your home university the project number you want to apply for and if there are any mobilities still available. Staff Mobility for Teaching Assignment (STA) – the teaching staff member visits partner university for teaching purposes, the visit lasts 5 days (8 hours of lectures in total) plus 2 days for the travel. Staff Mobility for Training (STT) – the staff member visits partner university in for training purposes (eg. job shadowing, workshops, international staff meetings), the visit lasts 5 days plus 2 days for the travel. We reccommend this type of mobility for administrative staff involved in international issues at their home university. Incoming staff members use Dream Apply system in order to submit their documents to University of Szczecin. Please check Application step by step tab for more information. Call for application is closed, please check another project. 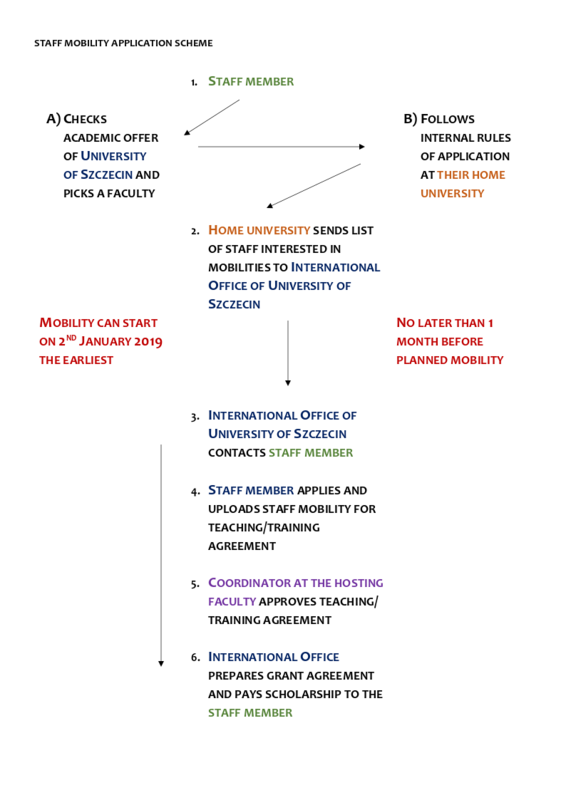 Formal procedures of applying for a staff mobility for teaching assignment and for training at The University of Szczecin (Erasmus+ staff mobility between Partner and Programme countries) within the Project no. 2017-1-PL01-KA107-037002 (1.06.2017 – 31.07.2019). 1. The staff eligible for Erasmus+ staff mobility for teaching assignment (STA) and for training (STT) is academic staff employed at the partner universities which have signed with The University of Szczecin an Inter-institutional agreement for this type of the mobility. 2. The interinstitutional agreement should be signed before starting of the individual mobility. l) Viet Nam: National University of Economics, Foreign Trade University. 4. The duration of STA and STT mobility lasts 5 days. 5. Staff mobility for teaching assignment and for training can be realized starting from 6th November 2017 until 30th June 2019. 6. The qualification process takes place at the partner university according to the rules set out by the partner university and Erasmus + Programme Guide. The obligatory documents to be filed at the partner University are application form and STAFF MOBILITY FOR TEACHING/TRAINING MOBILITY AGREEMENT (Section II. COMMITMENT OF THE THREE PARTIES doesn’t need to be approved by the receiving institution – The University of Szczecin at that moment). 7. The partner university sends a list of the applicants to International Office of The University of Szczecin no later than 3 weeks before the mobility starts. • incoming mobility from Viet Nam: 1 STA mobility, 1 STT mobility. 9. International Office of The University of Szczecin forwards the application documents to the respective Faculties. The Faculties send back the list of the approved candidates within 10 days with their STAFF MOBILITY FOR TEACHING/TRAINING MOBILITY AGREEMENT approved. o added value of the mobility. 11. International Office informs Partner University and approved candidates immediately after receiving a list of the approved candidates. 12. A scholarship for the staff mobility for teaching (‘Individual support’) is 140 Euro per day. 13. A participant may start their travel earlier than one day before the start of the mobility or return later than one day after the end of the mobility , but only up to two additional days ( one day before the mobility and one day after its completion ) will be taken into account when calculating the scholarship (‘Individual support’). 15. The obligation to complete the procedures of obtaining a visa and insurance lies with the employee, however, International Office of The University of Szczecin provides all the documents (eg. invitation) necessary for the visa procedure. 16. A person qualified for the STA/STT mobility becomes a beneficiary of the Erasmus+ program at the moment of signing the grant agreement, which is the basis for payment of the scholarship. The scholarship agreement should be signed by the employee for 2 weeks prior to scheduled departure. 17. After the end of the mobility, employee receives a Certificate of attendance confirmed by the respective faculty of the University of Szczecin. Formal procedures of applying for a staff mobility for teaching assignment and for training at The University of Szczecin (Erasmus+ staff mobility between Partner and Programme countries) within the Project no. 2018-1-PL01-KA107-048630 (1.06.2018 – 31.07.2020). n) Viet Nam: National University of Economics, Foreign Trade University. 5. Staff mobility for teaching assignment and for training can be realized starting from 2nd January 2019 until 30th June 2020. 6. The qualification process takes place at the partner university according to the rules set out by the partner university and Erasmus + Programme Guide. 7. The partner university sends a list of the applicants to International Office of The University of Szczecin no later than 4 weeks before the mobility starts. 8. The staff member applies at the University of Szczecin on-line with the use of the DreamApply system. • incoming mobility from Viet Nam: 1 STA mobility. 16. A person qualified for the STA/STT mobility becomes a beneficiary of the Erasmus+ program at the moment of signing the grant agreement, which is the basis for payment of the scholarship. The scholarship agreement should be signed by the staff memeber 2 weeks prior to scheduled departure. Please, have a look at attached tutorial on how to use this system.